display IV THE UNITED STATES HAS PROPOSED A PLAN An international Atomic Development Authority would control all uranium and thorium, all atomic production plants, all atomic activities dangerous to mankind, and license and inspect all other atomic activities. display I ATOMIC ENERGY MUST BE MAN'S SERVANT, NOT HIS MASTER Regions lacking coal can flourish through atomic power. Radioactive elements can bring science new knowledge. Atomic radiations can cure disease instead of killing men. EACH OF US HAS A PERSONAL STAKE IN WORLD CONTROL OF ATOMIC ENERGY We cannot turn the clock back now. We must choose progress or destruction. display II time table man vs atom STUDY MATERIALS ON ATOMIC ENERGY CONTROL [[italics]](Excellent pamphlets, study guides, and program materials are available for background information, speaker's reference, and forum distribution. Below are listed the more important. Note the prices of each, and order your copies from the National Committee on Atomic Information, 1749 L Street, NW, Washington 6, D. C.)[[end italics]] STUDY KIT ON ATOMIC ENERGY. Contains a study and discussion outline, the Acheson Report, and an assortment of pamphlets and reprints on every aspect of atomic energy. $1 postpaid. ATOMIC KEY TO THE FUTURE. 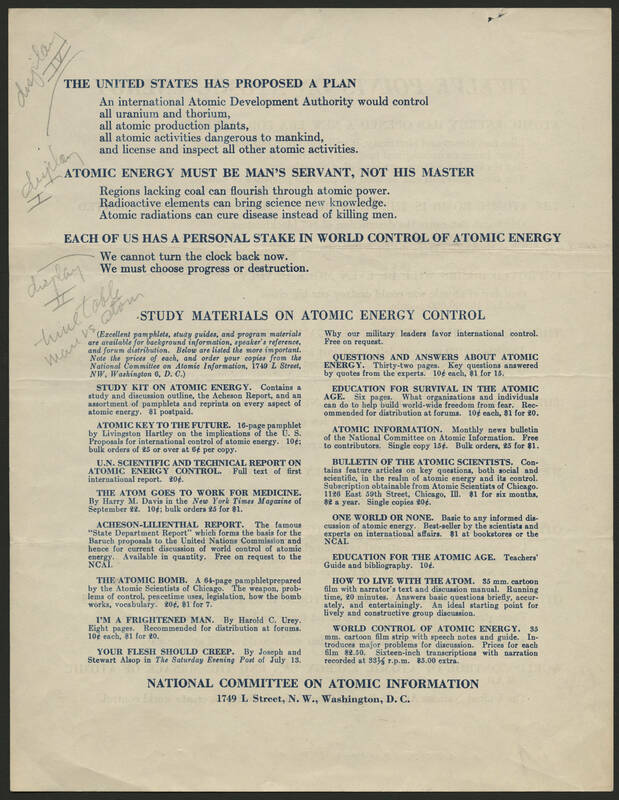 16-page pamphlet by Livingston Hartley on the implications of the U.S. Proposals for international control of atomic energy. 10[[cent symbol]]; bulk orders of 25 or over at 6[[cent symbol]] per copy. U.N. SCIENTIFIC AND TECHNICAL REPORT ON ATOMIC ENERGY CONTROL. Full text of first international report. 20[[cent symbol]] THE ATOM GOES TO WORK FOR MEDICINE. By Harry M. Davis in the [[italics]]New York Times Magazine[[end italics]] of September 22. 10[[cent symbol]]; bulk orders 25 for $1. ACHESON-LILIENTHAL REPORT. The famous "State Department Report" which forms the basis for the Baruch proposals to the United Nations Commission and hence for current discussion of world control of atomic energy. Available in quantity. Free on request to the NCAI. THE ATOMIC BOMB. A 64-page pamphletprepared by the Atomic Scientists of Chicago. The weapon, problems of control, peacetime uses, legislation, how the bomb works, vocabulary. 20[[cent symbol]], $1 for 7. I'M A FRIGHTENED MAN. By Harold C. Urey. Eight pages. Recommend for distribution at forums. 10[[cent symbol]] each, $1 for 20. YOUR FLESH SHOULD CREEP. By Joseph and Stewart Alsop in [[italics]]The Saturday Evening Post[[end italics]] of July 13. Why our military leaders favor international control. Free on request. QUESTIONS AND ANSWERS ABOUT ATOMIC ENERGY. Thirty-two pages. Key questions answered by quotes from the experts. 10[[cent symbol]] each, $1 for 20. ATOMIC INFORMATION. Monthly news bulletin of the National Committee on Atomic Information. Free to contributors. Single copy 15[[cent symbol]]. Bulk orders, 25 for $1. BULLETIN OF THE ATOMIC SCIENTISTS. Contains feature articles on key questions, both social and scientific, in the realm of atomic energy and its control. Subscription obtainable from Atomic Scientists of Chicago. 1126 East 59th Street, Chicago, Ill. $1 for six months, $2 a year. Single copies 20[[cent symbol]]. ONE WORLD OR NONE. Basic to any informed discussion of atomic energy. Best-seller by the scientists and experts on international affairs. $1 at bookstores or the NCAI. EDUCATION FOR THE ATOMIC AGE. Teachers' Guide and bibliography. 10[[cent symbol]]. HOW TO LIVE WITH THE ATOM. 35 mm. cartoon film with narrator's text and discussion manual. Running time, 20 minutes. Answers basic questions briefly, accurately, and entertainingly. An ideal starting point for lively and constructive group discussion. WORLD CONTROL OF ATOMIC ENERGY. 35 mm. cartoon film strip with speech notes and guide. Introduces major problems for discussion. Prices for each film $2.50. Sixteen-inch transcriptions with narration recorded at 33 1/3 r.p.m. $5.00 extra. NATIONAL COMMITTEE ON ATOMIC INFORMATION 1749 L Street, N. W., Washington, D.C.